The Japanese navy's largest ship has joined up with the USS Ronald Regan aircraft carrier strike group for joint exercises in the South China Sea, the latest sign of Japan's increased presence in the region on which it depends for much of its foreign trade. Joined by two guided missile destroyers, the helicopter carrier JS Kaga is on a southern cruise that includes port calls in India, Sri Lanka, Singapore, Indonesia and the Philippines. The Japan Times newspaper said Friday's exercise included sailing in formation, maneuvering procedures, replenishment-at-sea and the exchange of liaison officers. The almost 20,000-ton Kaga can carry up to 28 aircraft and has a crew of 400. China has repeatedly denounced Japanese military activity in the seaway it claims as its own territory, particularly when that includes joint maneuvers with the U.S. and other countries considered outside interlopers by Beijing. China's defense ministry last week accused Japan of seeking excuses to justify amending its pacifist constitution and return to its "old past of expansionism." Despite such protests, the government of Japanese Prime Minister Shinzo Abe has responded to China's growing assertiveness in the South China Sea by boosting its own presence there. 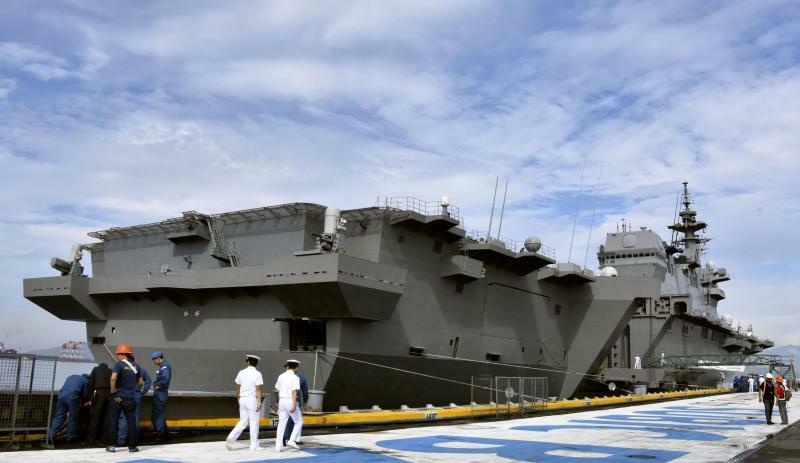 That was underscored by the dispatch of the helicopter carrier JS Izumo to the region for a three-month tour last year, described by Japanese media as the navy's largest show of force in the South China Sea since World War II. An estimated $5 trillion in global trade traverses the South China Sea annually, much of it traveling to or from Japan. Philippine officials say they notified China about a navy frigate that ran aground near a hotly disputed area of the South China Sea in hopes of avoiding any misunderstandings. The Philippine military said the BRP Gregorio del Pilar ran aground during a routine patrol Wednesday night in the vicinity of Half Moon Shoal, called Hasa Hasa in the Philippines. The crew was unhurt. The barren shoal is on the eastern edge of the disputed Spratly archipelago, where tensions have run high in recent years after China transformed seven disputed reefs into islands, including three with runways, and reportedly installed missile defense system. 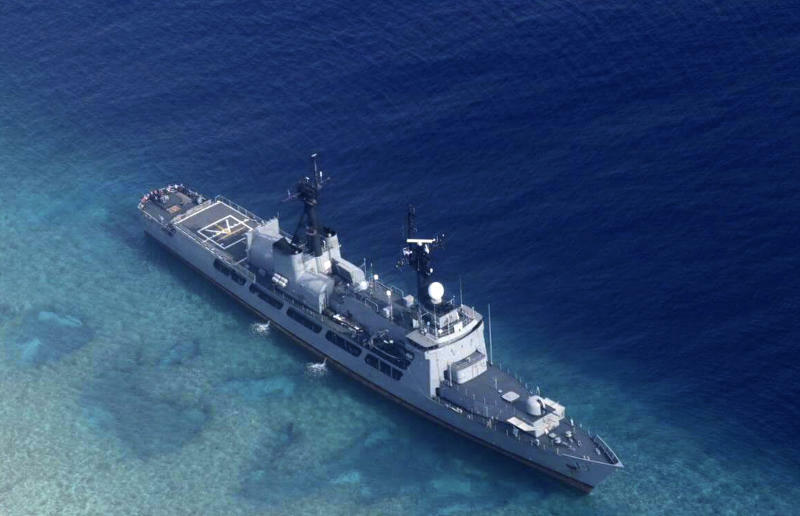 Philippine Defense Secretary Delfin Lorenzana said China offered to help free the ship but the Philippines declined because it was able to handle the matter on its own. The Philippines earlier was one of the most vocal critics of China's assertive moves in the disputed waters. 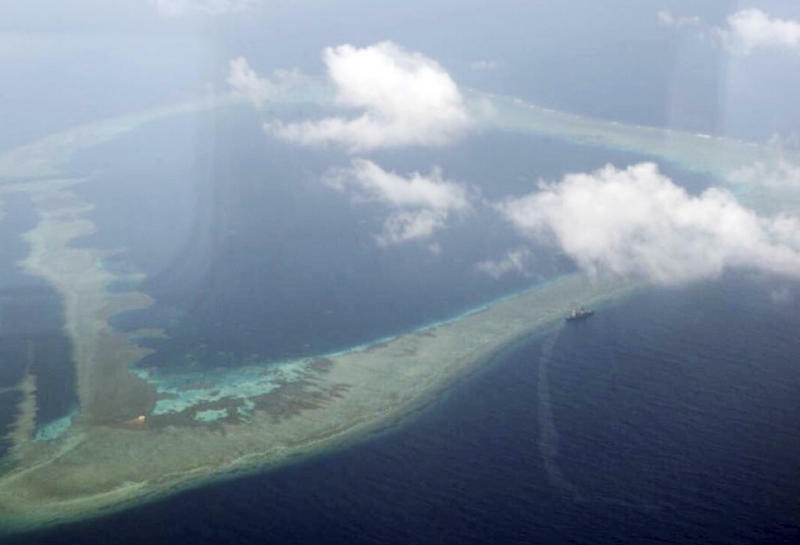 In 2016 it largely won a complaint it lodged before an international tribunal that invalidated Beijing's sweeping territorial claims in the South China Sea. Philippine President Rodrigo Duterte, however, took steps to revive once-frosty ties with China after he took office in 2016 as he sought infrastructure funding and more trade and investment from Beijing. The frigate is one of three former U.S. Coast Guard cutters acquired by the Philippine military from the United States that now are the Philippines' largest warships. China's defense ministry said it scrambled jet fighters and took other measures in response to operations by U.S. Air Force B-52 bombers in the vicinity of the South China Sea. Defense Ministry spokesman Col. Wu Qian said Thursday that the U.S. planes entered China's self-declared East China Sea air defense identification zone on Aug. 23. He said Chinese planes were dispatched for surveillance purposes and that other unspecified actions were taken. The U.S. Pacific Air Forces said two U.S. Air Force B-52H Stratofortress bombers departed from Anderson Air Force Base in Guam and participated "in routine training missions" on Aug. 27 and 30. It wasn't clear whether those were the same missions Wu was referring to. The statement said the bombers assigned to the 96th Expeditionary Bomb Squadron "conducted training in the vicinity of the South China Sea before returning to Guam." It said they also integrated with the strike group attached to the aircraft carrier USS Ronald Reagan. "U.S. Indo-Pacific Command's Continuous Bomber Presence (CBP) operations have been ongoing since March 2004; these recent missions are consistent with international law and United States' long-standing and well-known freedom of navigation policies," the statement said. "CBP operations demonstrate the United States' commitment to a free and open Indo-Pacific, help maintain the readiness of U.S. forces and improve coalition and joint service interoperability," it said.